Consumers Union of Japan again participated in a large demonstration against the changes in Japan’s constitution. The event was held on November 19, 2015 outside the Parliament in Tokyo, and some 9000 people participated. 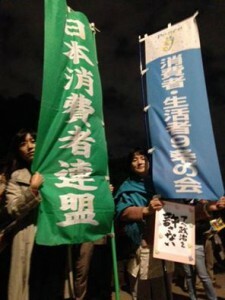 We were joined by our new group, Consumers and Citizens for Article 9, and the photo shows our two flags at the evening protest as we wish to collect 20 million signatures until April, 2016 to abolish the changes made to the popular “Peace Clause” of the post-war constitution. The famous fish market in Tsukiji, Tokyo will move to a new location. 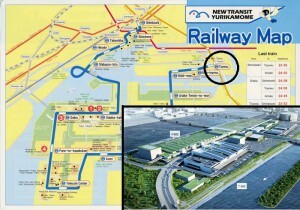 Doubts remain about the safety of the Toyosu site, which formerly hosted a large coal plant for making city gas.